Recently, I discovered several innovative labs in Europe worth checking out. Both groups advocate better design for public service. The Helsinki Design Lab assist government leaders and key decision makers in viewing challanges from a big-picture perspective using HDL’s “strategic design” philosophy. 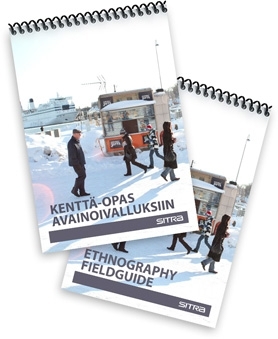 But, what I am really interested in is HDL’s Design Ethnography Fieldguide that is readily available in English. With easy to follow directions, checklists and activities, this is a great beginner’s guide to conducting your own small scale usability research. NESTA is a UK based group whose mission is to make the UK more innovative. 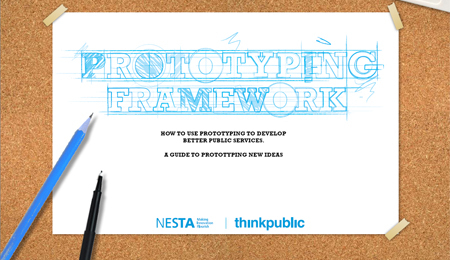 NESTA has put out a free guide for prototyping new ideas. This is a comprehensive and easy to follow guide complete with sample activities and tips throughout. Look out NYC, it’s Urban Design Week! Urban Design Week is a new public festival created to engage New Yorkers in the fascinating and complex issues of the public realm, and to celebrate the streetscapes, sidewalks, and public spaces at the heart of city life. Through an open-call ideas competition and a rich roster of discussions, tours, screenings, workshops, and events across the five boroughs, UDW will highlight the fact that cities are made by collective effort, and that each of us can play a part. Check out 150 proposals that reimagine the future of New York City’s public spaces, streetscapes and sidewalks. Although it wasn’t one of the 10 winners, my personal favorite is the Pop-Up NY concept by a group from the Netherlands. The Pop-Up is furniture that can be cranked up out of the pavement for easy seating then pumped back down when not needed. The Uni was in downtown Manhattan last weekend and will be at the Brooklyn Book Festival this weekend. Check out our post on the Uni. We all know that the value of business cards comes from giving them out. Check out our post on making the most of your business card. Everyday Usability: Why Are You Looking at Trash? Check out more posts in the Everyday Usability series.